PATTERSON, David Trotter, (son-in-law of Andrew Johnson), a Senator from Tennessee; born at Cedar Creek, near Greeneville, Greene County, Tenn., February 28, 1818; attended the common schools and Greeneville College for two years; studied law; admitted to the bar in 1841 and commenced practice in Greeneville, Tenn.; engaged in manufacturing; judge of the first circuit court of Tennessee 1854-1863; upon the readmission of the State of Tennessee to representation on July 24, 1866, was elected as a Democrat to the United States Senate; presented his credentials on July 26, 1866, and took the oath of office on July 28, 1866, after the Senate resolved a challenge to his credentials, and served until March 3, 1869; was not a candidate for reelection; engaged in the management of his extensive agricultural interests; died in Afton, near Greeneville, Tenn., November 3, 1891; interment in the Andrew Johnson National Cemetery, Greeneville, Tenn.
McKellar, Kenneth. 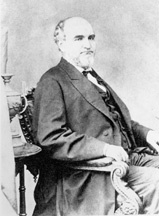 David T. Patterson, in Tennessee Senators as Seen by One of Their Successors. Kingsport, Tenn.: Southern Publishers, Inc., 1942, 316-324.